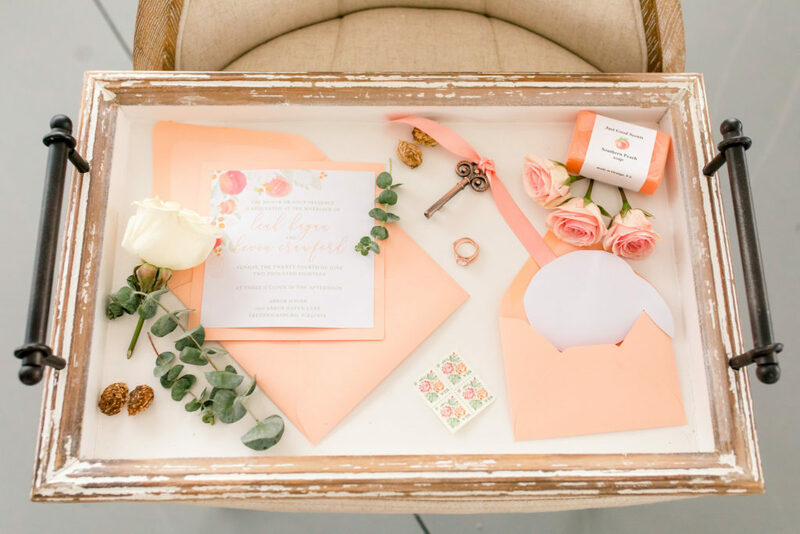 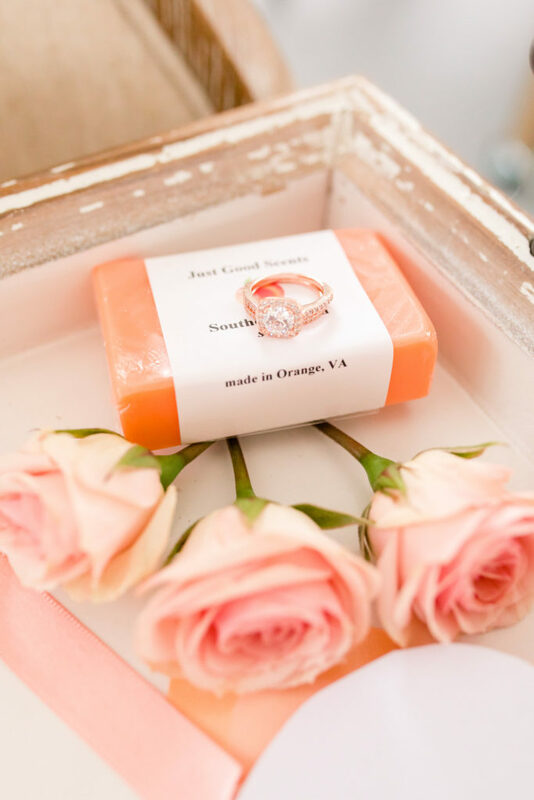 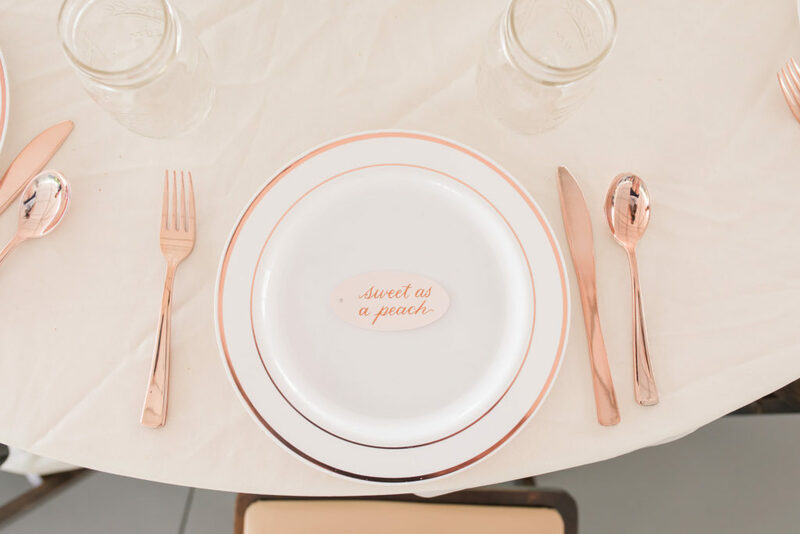 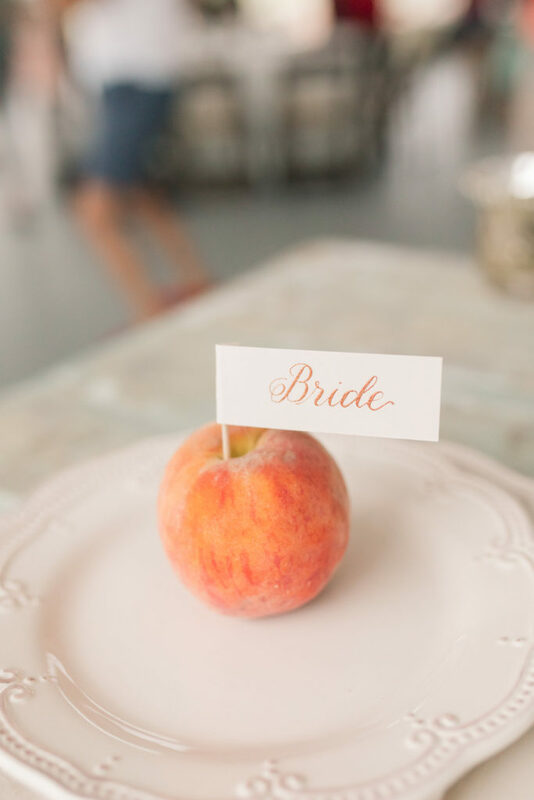 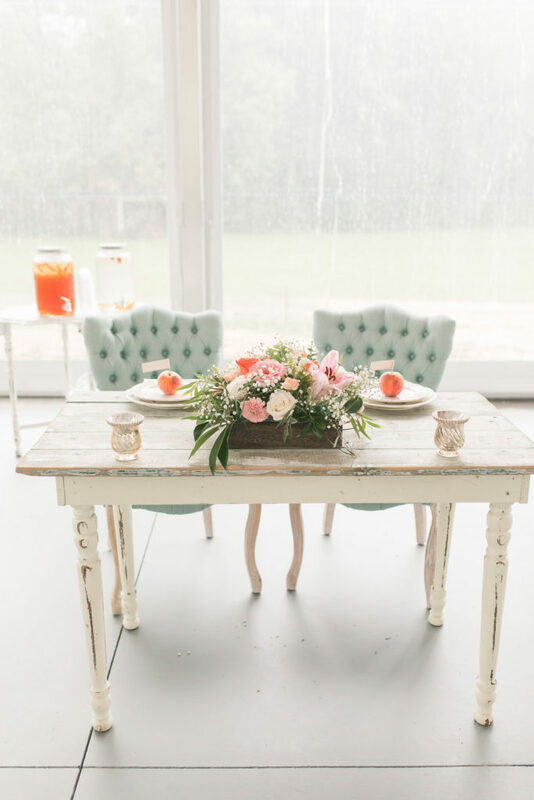 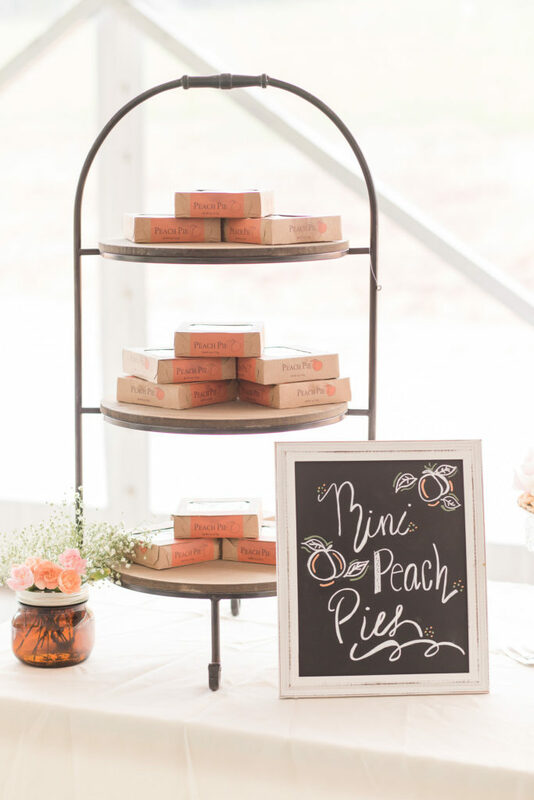 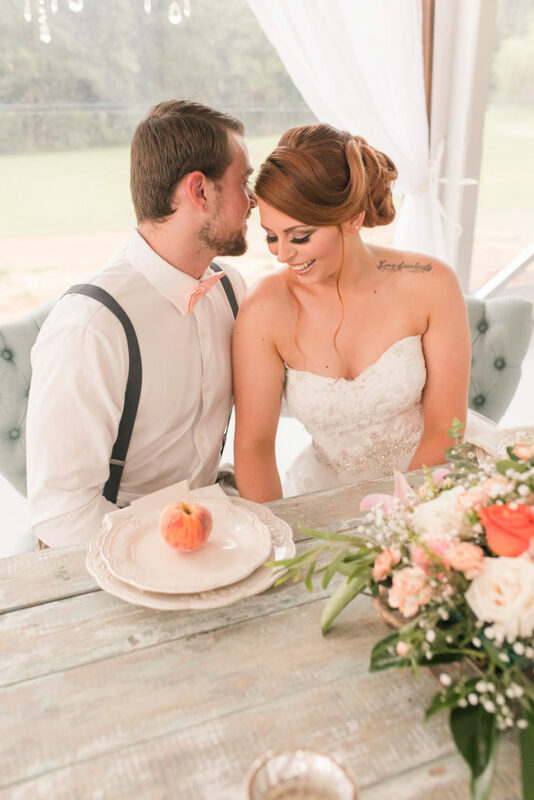 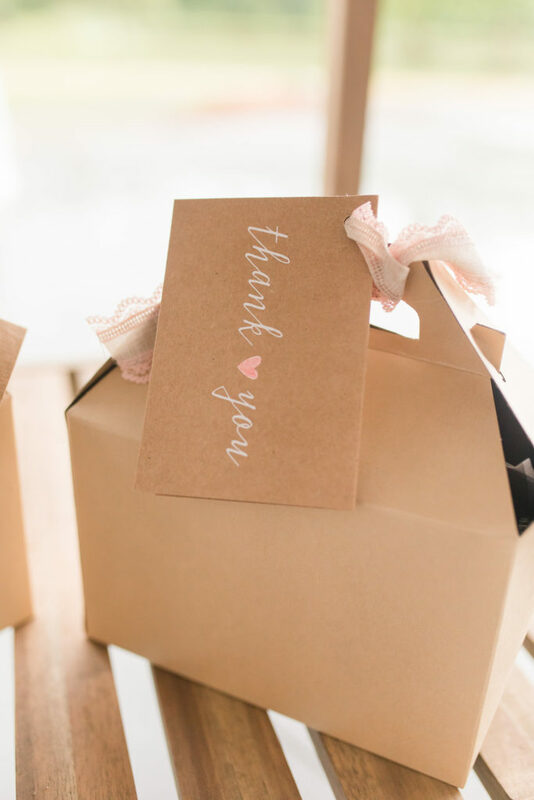 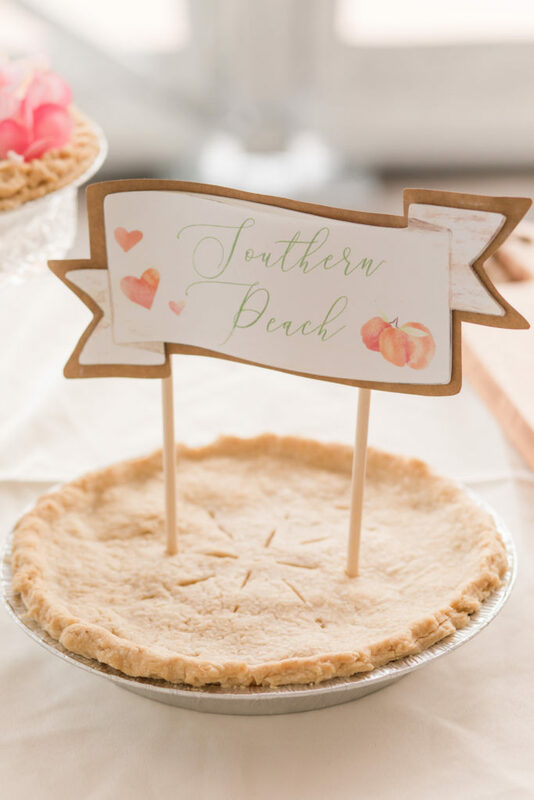 This adorable styled shoot is as sweet as a peach, literally. 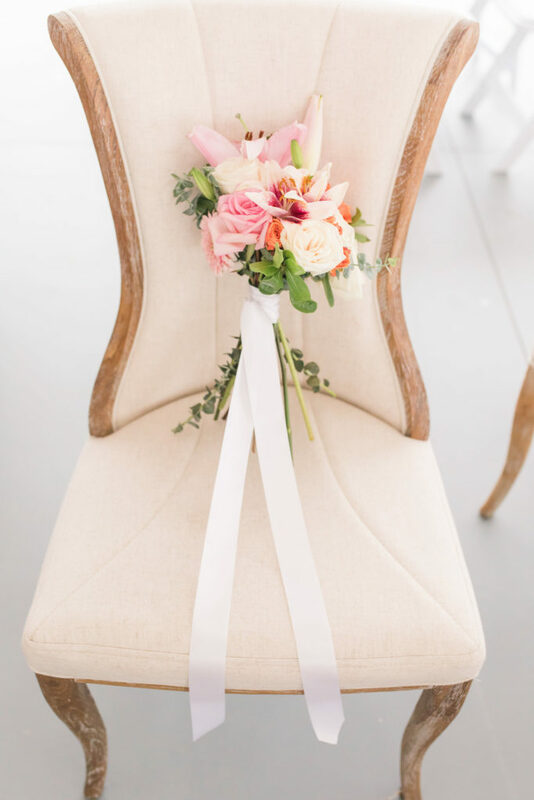 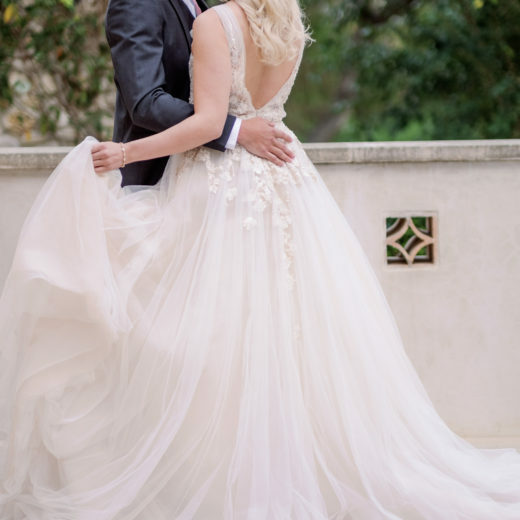 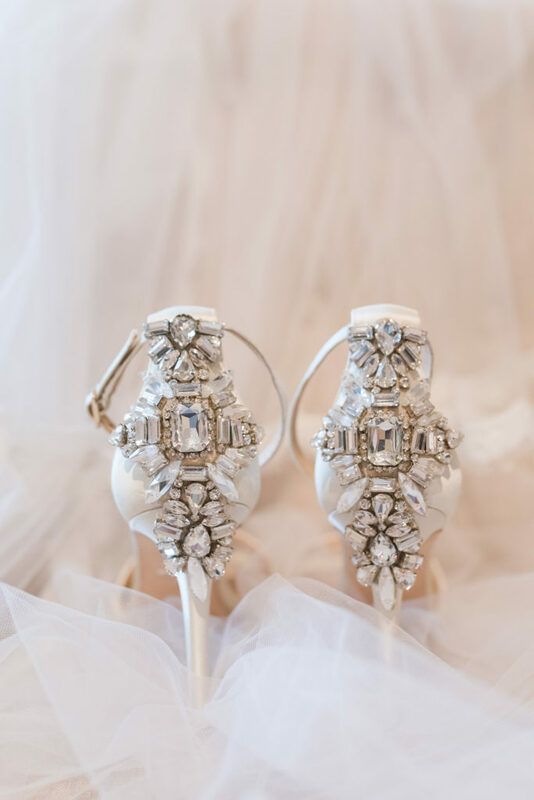 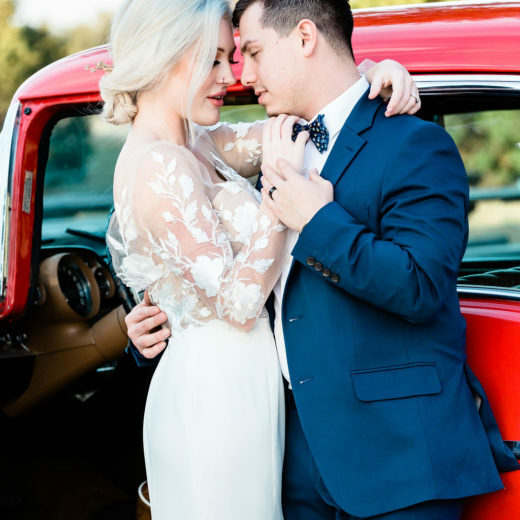 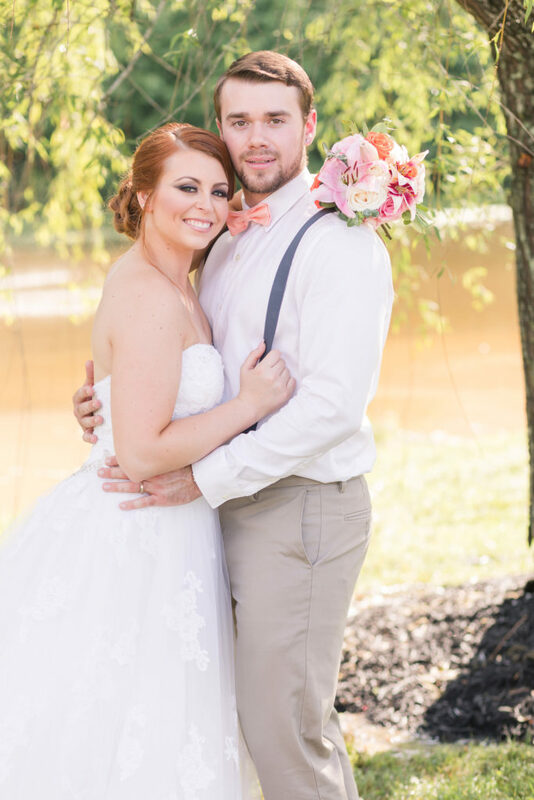 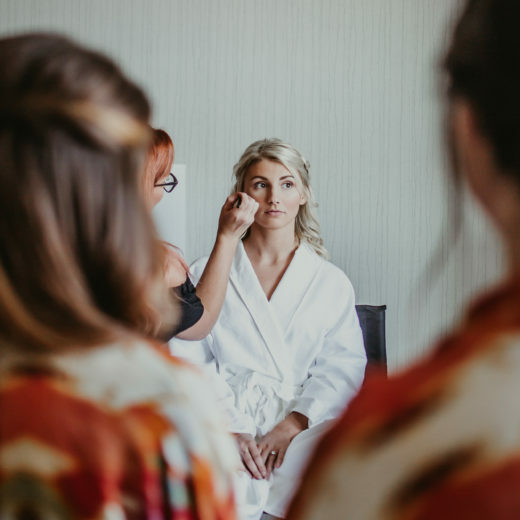 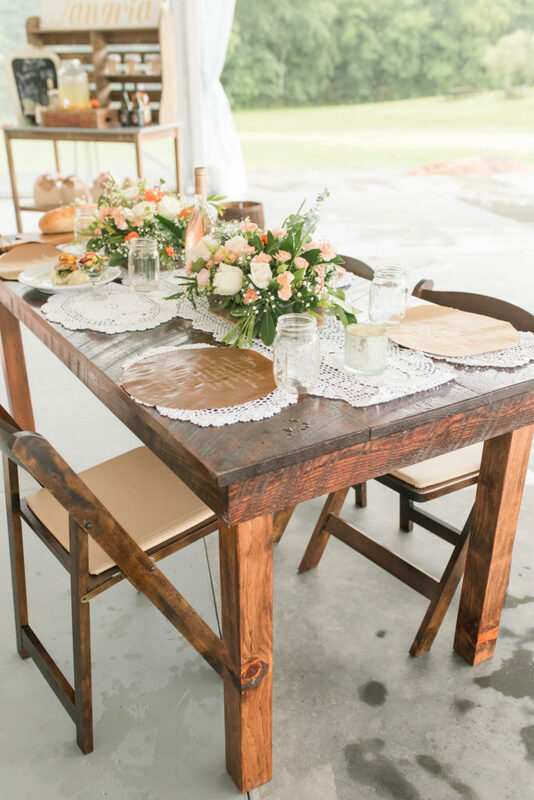 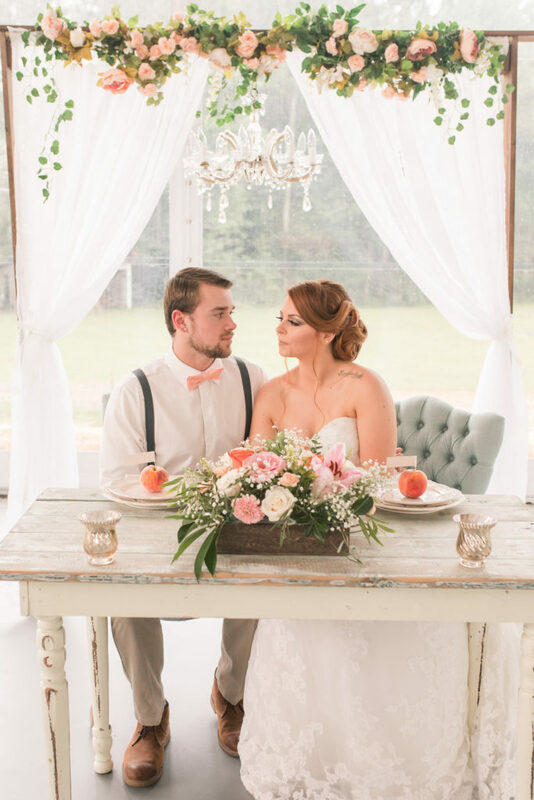 Fredericksburg, Virginia area wedding pros collaborated on this beautiful styled shoot to showcase a new venue, Arbor Haven Weddings and Events. 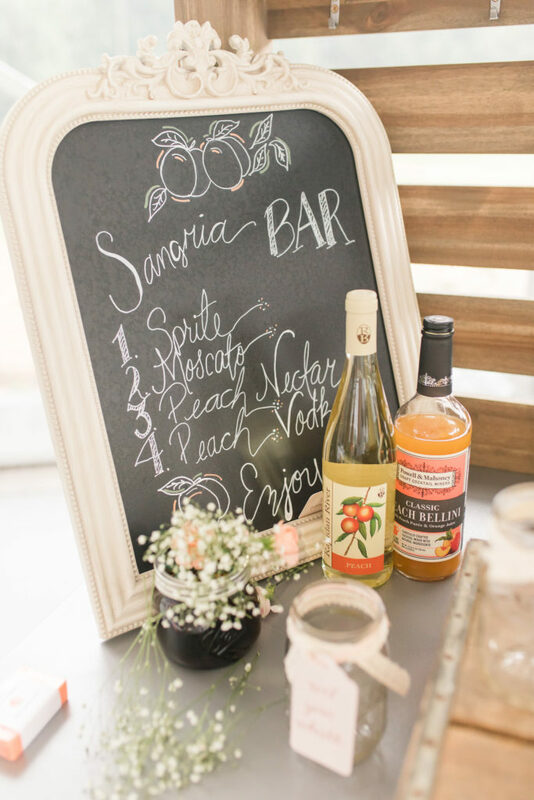 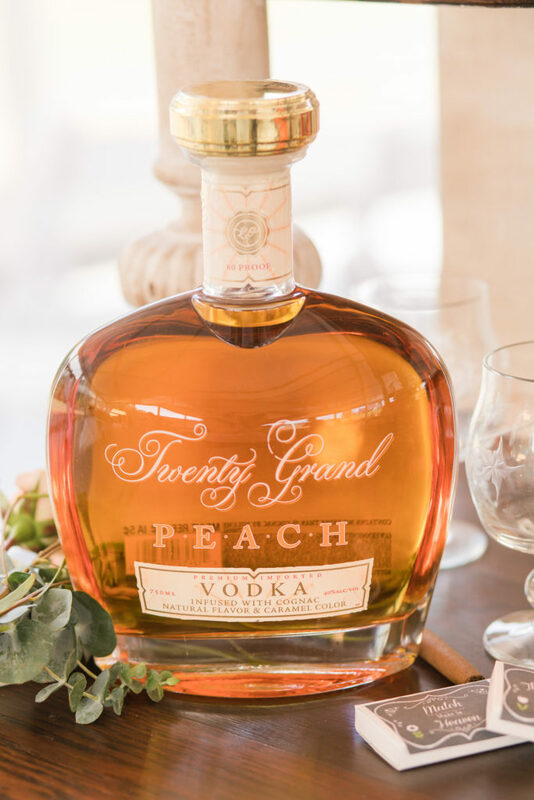 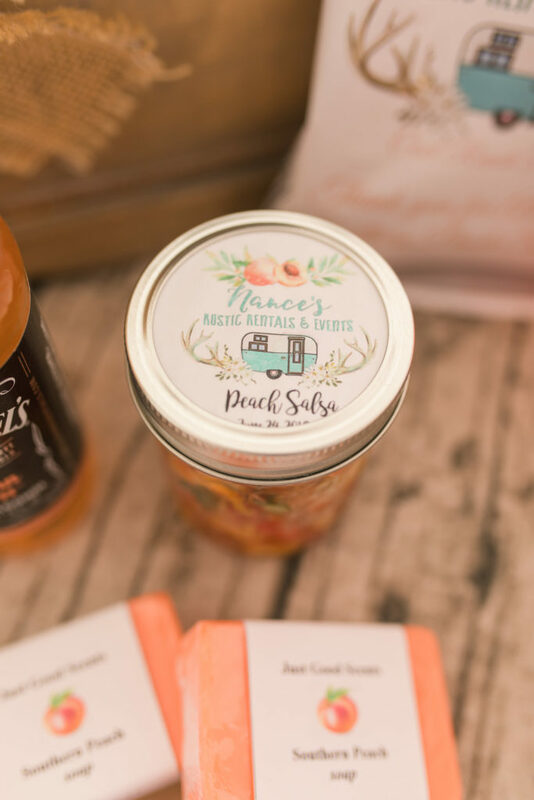 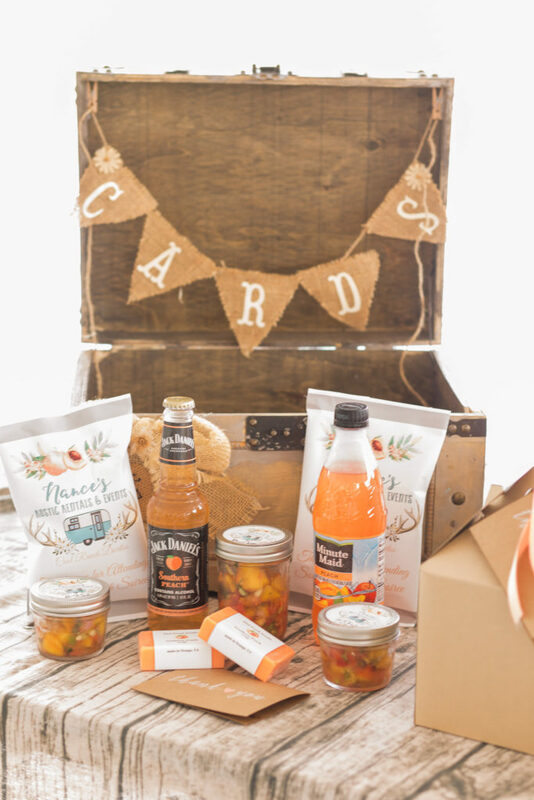 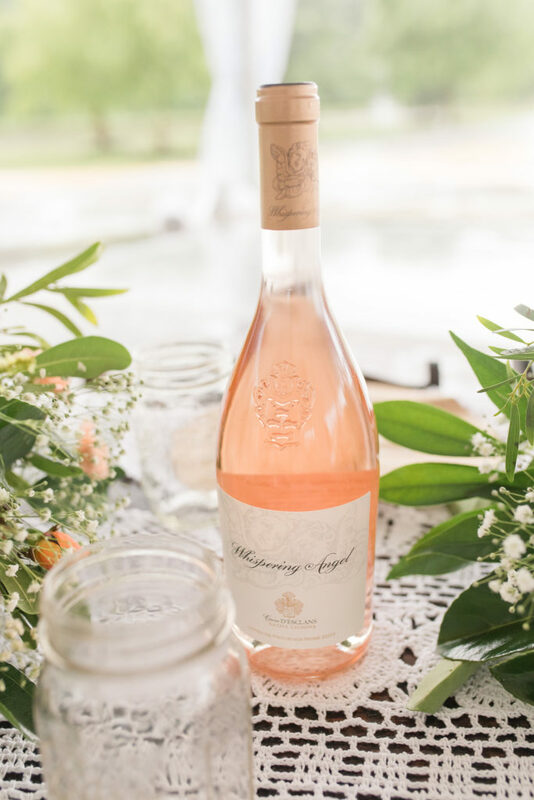 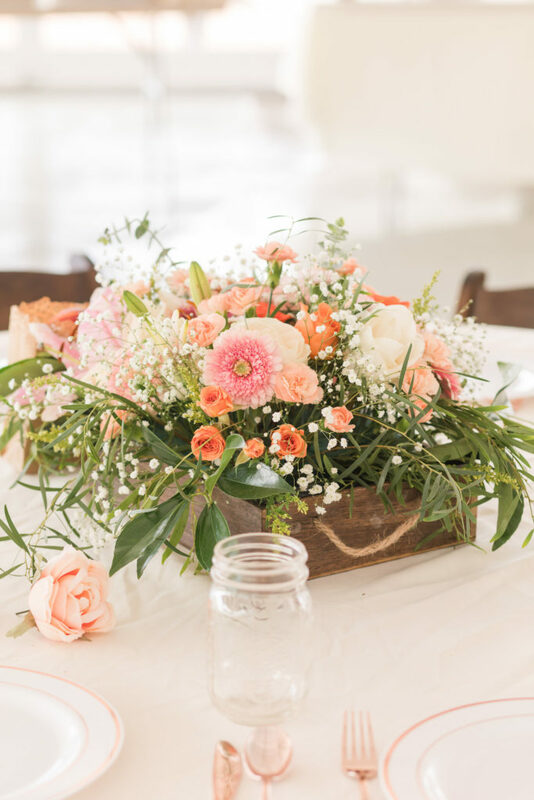 The team created a fresh approach to the peach color palette with stunning florals, farm fresh peaches, delicious peach infused cuisine, a peach sangria bar and more. 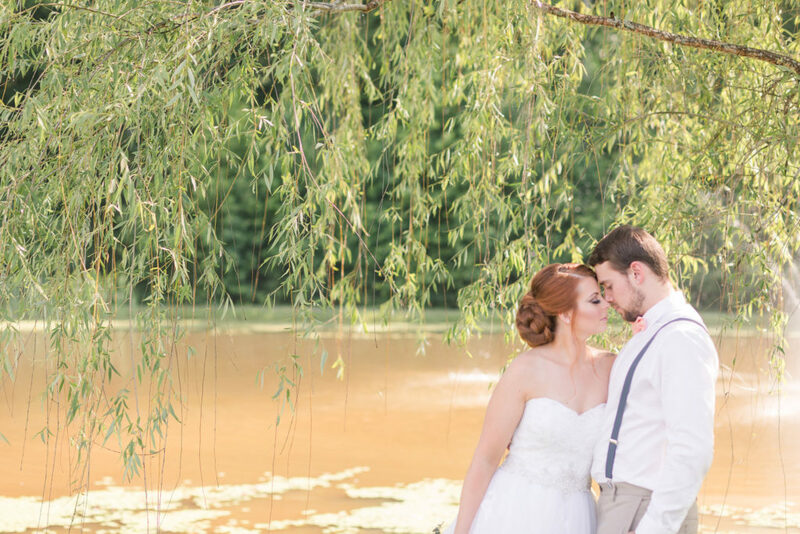 This picturesque farm venue featured a reception staged in open-side tenting beside the beautifully landscaped pond. 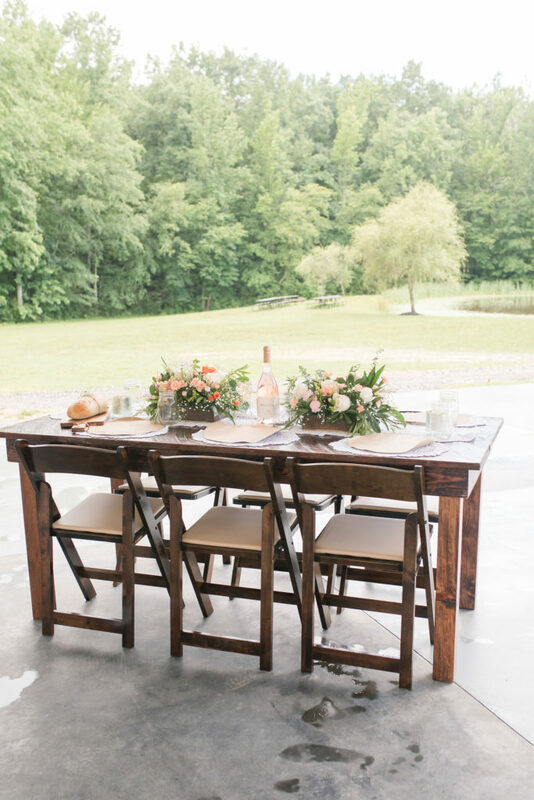 A charming barn and rolling landscape were the perfect background for the creative design which was sweet and country without giving in to the too often seen burlap and super rustic decor. 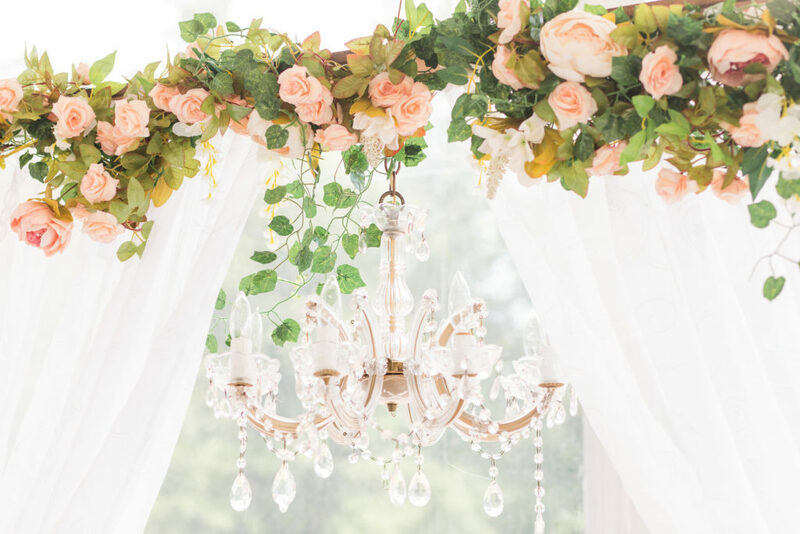 Light and airy curtains flanked a crystal chandelier to form a backdrop for the lovely sweetheart table. 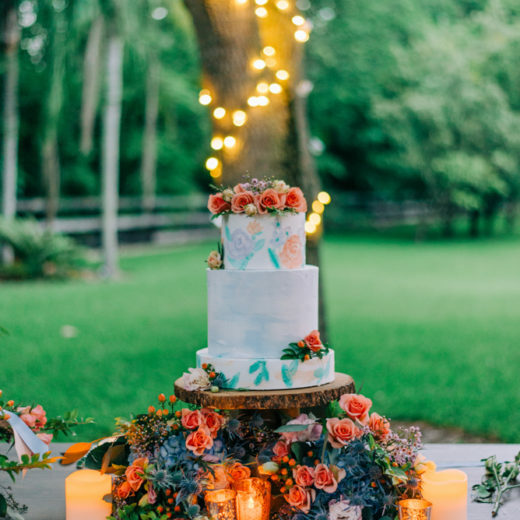 Floral decor in a variety of pink, peach and white roses, combined with pink lilies, baby’s breath and zinnia graced the backdrop and tables and cascaded down the three tiered wedding cake. 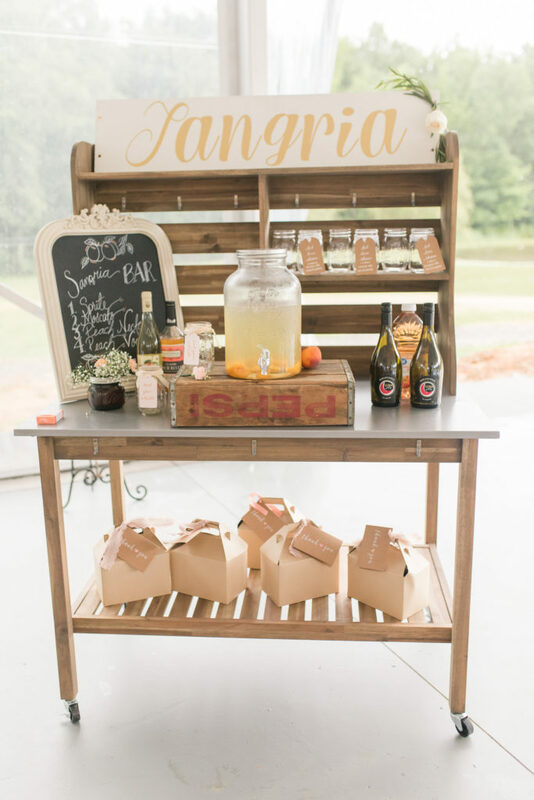 We especially loved the styling on the two peach inspired sangria and gentlemen’s peach vodka and cigar bars. 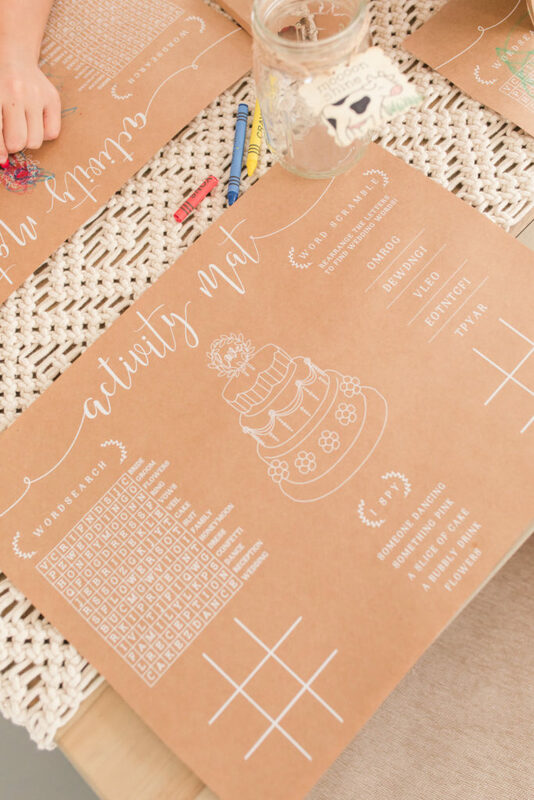 The stationers outdid themselves with super cute invitations, menu cards, dessert toppers, and an adorable kids’ coloring mat. 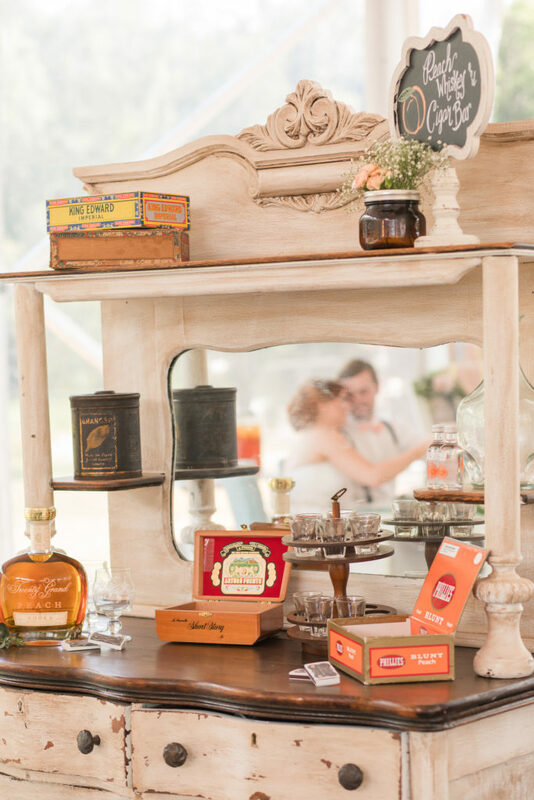 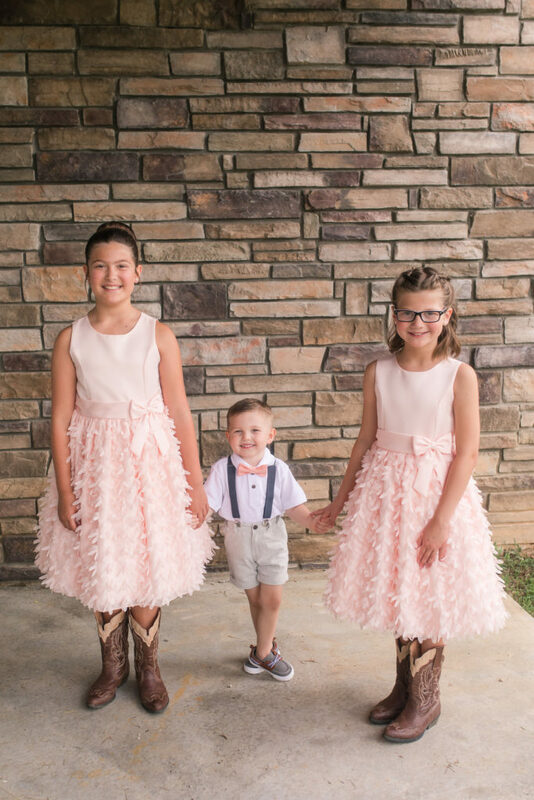 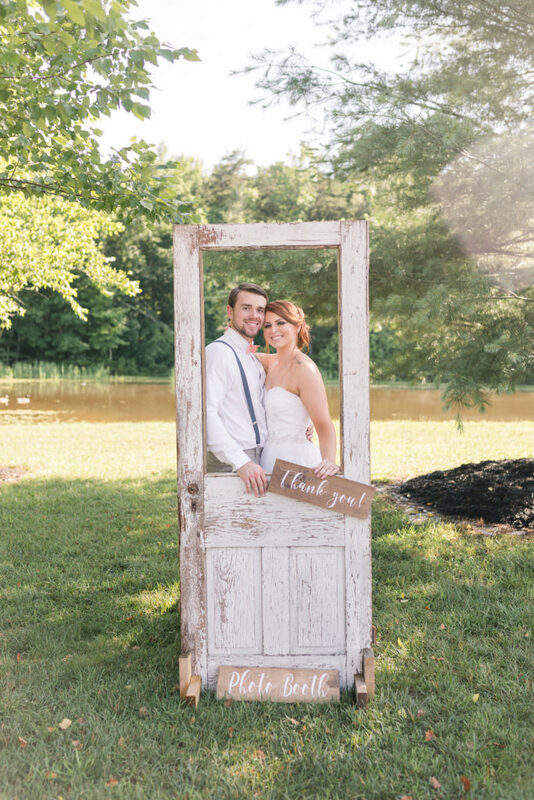 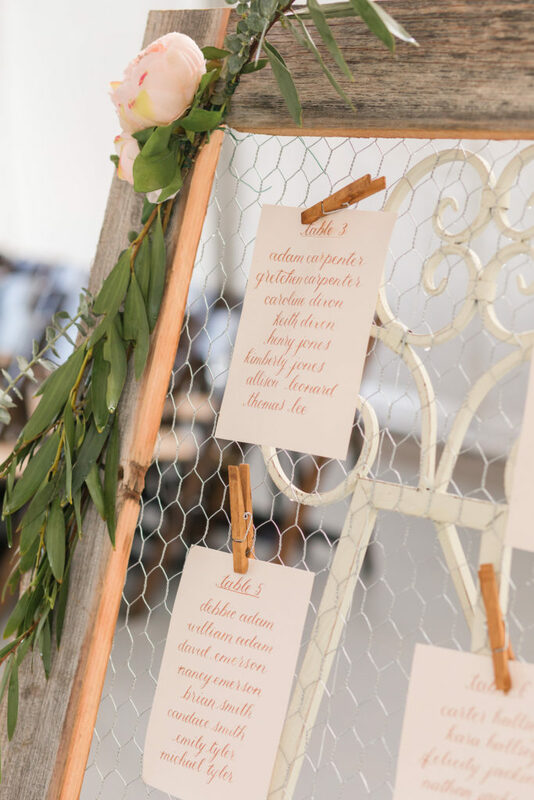 An over sized frame of chicken wire on an easel served as a farm-style seating chart, and a vintage door by the pond was the perfect photo “booth” for this styled event. 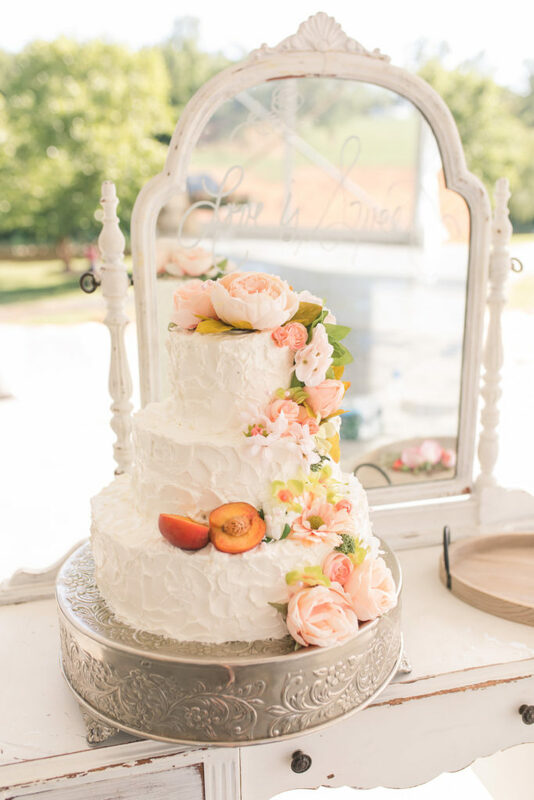 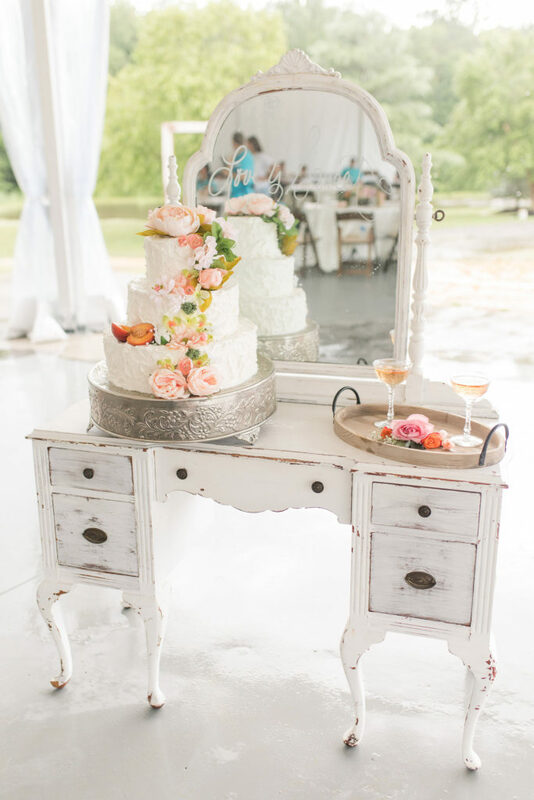 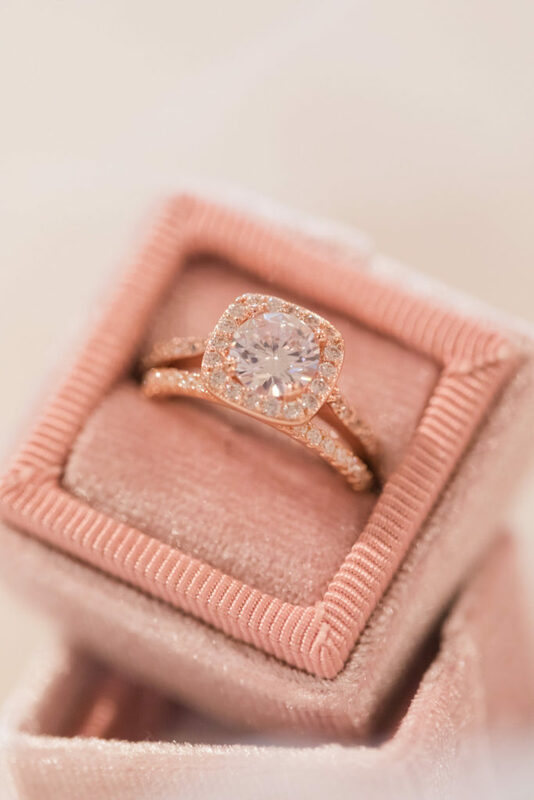 The creative team did a fabulous job, as there are so many sweet, peachy details to inspire any peach-loving bride.